A new update of GeeXLab is up for grabs. GeeXLab 0.9.4.0 is released for all platforms: Windows 32 and 64-bit, Mac OS X, Linux 64-bit and Raspberry Pi (Raspbian). 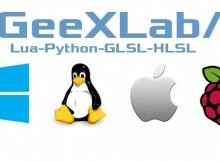 You can download GeeXLab as well as the latest code sample pack from THIS PAGE. The last iteration 0.9.4.0 adds few minor features to the Windows version: the online checking for new versions and a command line option to disable the Close button in the title/system bar. You can still quit the demo with the ESC key even if the effect of the Close button is disabled. A new Lua helper lib has been added in GeeXLab standard libs: libs/lua/gfx03.lua. The code sample pack v2.57+ contains samples that show how to use gfx03.lua (look at the host_api/GLSL_bookofshaders/ folder). A minimal sample (for win/linux/osx) is also available here: host_api/gfx03_minimal.xml. the online checking of newer versions of GeeXLab. + [WINDOWS] added online checking of newer versions of GeeXLab. the quit button (the cross) on the window system bar. + added new Lua utility library: gfx03.lua. + added /log_framerate command line param to quickly log framerates (cur/avg). * [WINDOWS] fixed a bug in the Direct3D 12 plugin. elapsed time is only used in the update of the average FPS. + added /python_home command line parameter to set the Python home directory. + added get_gpu_driver() to gh_gml lib (lua / python).
! [WINDOWS] updated GPU monitoring plugin to support AMD Crimson drivers. * [WINDOWS] fixed: the main 3d window has now the keyboard focus at startup. * [WINDOWS] fixed gh_gml.gpu_power_get_power_limit() (NVIDIA GTX 600+). * fixed gh_gpumon.draw_gpu_data_v2() and gh_gpumon.draw_gpu_data_v4().
! [WINDOWS] updated GPU Shark 0.9.7.0.